Hola Amigas! It is a GORGEOUS day in Jersey! 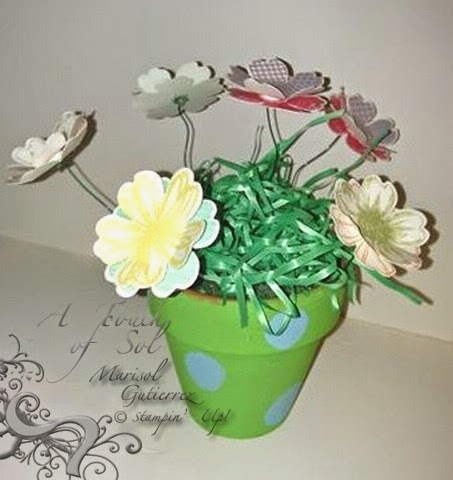 Here is another share from last month's Mini Crafty Chicas Class. After we did the Father's Day gifts and had snack we still had time before pick up. I had enough supplies so I let the girls make this cure Flower Pot. They painted them and added polka dots. They stamped their flowers and punched them out. They love that stamp sets have matching punches. I added a foam circle inside the pot and flower wire to the flowers as well as Easter Grass and TaDa! CUTENESS!